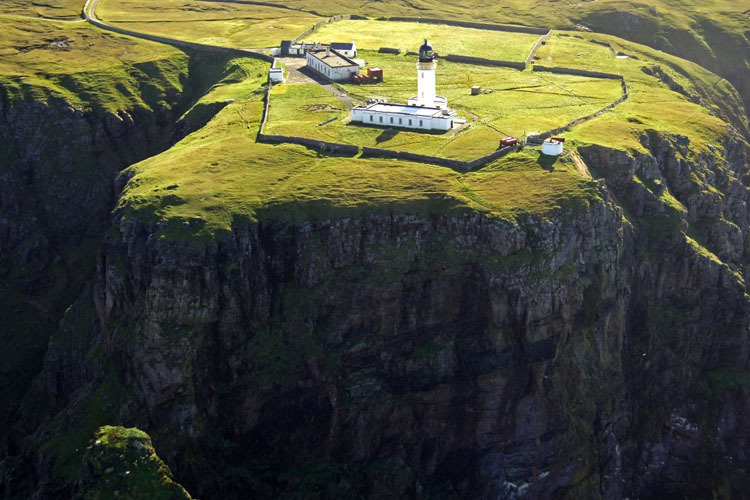 The name of the headland where this lighthouse stands, Cape Wrath, comes not from the stormy waters of the area but from the Norse word for a "turning point", for here the Norsemen turned their ships to head home. This lighthouse marks the north western tip of the Scottish mainland, 11 miles from Durness village. To get to the cape you have to first take a ferry from Keoldale across the Kyle of Durness which takes around 15 minutes, and then there is an optional minibus which takes you to the Lighthouse, this takes about 30 minutes each way, and is around 2.5 hours in total. It dates from 1828, was built by Robert Stevenson, and stands over 121 metres above mean sea level and is situated on cliffs facing the Atlantic Ocean. The buildings, surrounded by a high wall, are extensive and include the lighthouse tower built of hand dressed stone and the rest of the building is constructed of large blocks of granite quarried from Clash Carnoch. A keepers house and a one storey signal station, from around the 1930s, is adjacent to the light station. It was manned until 1998. The duties of the lightkeeper not only involved looking after the light, but they also had to do most of the maintenance work on the station as well. In January 1977 the helicopter carried out the what was called the 'Cape Wrath Relief' - a history making moment as this was the first helicopter relief carried out at a shore-based Scottish lighthouse. The keeper's house is now occupied by resident caretakers, who opened a café for visitors in 2009. Much of the surrounding area is set aside for military training, and public access is tightly controlled. However, guided tours are available from Durness via minibus over a rough road for 11 miles. Granite tower with 81 steps to the top, attached to a 1-storey keeper's house. Lighthouse painted white, lantern black. Tours available daily May through September.